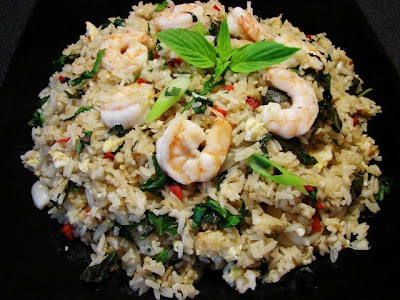 This Thai style fried rice is similar to my previous post for Nasi Goreng Pattaya. This basil fried rice is a lot easier and very delicious. As long as you got some cooled cooked rice it takes few minutes to prepare. If using raw prawn, fry the prawn in some hot oil till turning pinkish white. Take them out. Then fry the garlic then add rice stir till hot, sprinkle on fish sauce, soy sauce and sugar to taste. Push the rice to one side then add the egg stir to scramble then stir with rice. Add in the prawn and stir. Add in the chilli and spring onion and finally add in the basil, heat off. Ready to eat.